Result: Petra Kvitova defeated Mihaela Buzarnescu by 6-3, 6-2. Petra Kvitova took a great start in the first set as she scored the first point and kept on extending it. While, on the other hand Mihaela Buzarnescu was only able to recover three points and eventually lost the first set. Petra #Kvitova up a 6-3 set against Mihaela #Buzarnescu, and has just gone up a break in the second. However, Mihaela Buzarnescu opened the scoring of the next set but she failed to extend her lead large enough for his opponent to chase it. Petra Kvitova is into her 5th final of the season. Defeats Buzarnescu 63 62 to extend her Birmingham win-streak to 9. Has not lost a set all week. In the end Petra Kvitova sealed her win as Mihaela Buzarnescu lost some points on her serve. Petra Kvitova booked her name into the final of Birmingham Classic 2018 where she will face Magdalena Rybarikova. Sealed with an ace! @Petra_Kvitova will defend her #NatureValleyClassic title tomorrow against Rybarikova. Result: Magdalena Rybarikova defeated Barbora Strycova by 7-6(1), 6-4. Magdalena Rybarikova opened the scoring as Barbora Strycova failed to took the lead on her serve. Both players played well throughout the set as it eventually came to a tie-breaker after the score was equalized 6-6. 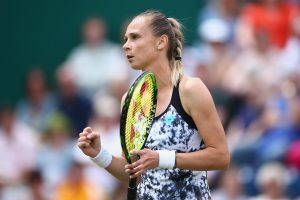 Magdalena #Rybarikova takes a 7-6(1) lead over Barbora #Strycova in the #NatureValleyClassic SFs. Magdalena Rybarikova claimed the victory in the first set as Barbora Strycova lost a total of three points on her serve. The next set started after a short break and again Magdalena Rybarikova took the lead. Defending champ Petra Kvitova is back into the Birmingham final, beating Mihaela Buzarnescu 6-3, 6-2 in the semis. She’ll face last year’s Wimbledon semifinalist Magdalena Rybarikova for the title. However, Barbora Strycova came in action and equalized the score after some time. But in the end, Barbora Strycova faced defeat by 6-4 as she lost the last point on her serve. Magdalena Rybarikova will now face the Czech star, Petra Kvitova in the final of Birmingham Classic 2018. Result: Elise Mertens and Demi Schuurs defeated Kveta Peschke and Nicole Melichar by 6-3, 2-6, 10-7. Elise Mertens and Demi Schuurs opened the scoring of the first set and extended their lead continuously at a fast pace. However, Kveta Peschke and Nicole Melichar struggled hard to recover the score but they were only able to score three points. In the end, Elise Mertens and Demi Schuurs won the opening set and the match moved on to the second set. Kveta Peschke and Nicole Melichar showed an outclass performance in the second set as they both were scoring points quickly. Elise Mertens and Demi Schuurs faced a terrible defeat in the end of this set and now the match came to the decisive set. Both the pairs gave their best in this set and after a tough fight, score became levelled at 7-7. However, Elise Mertens and Demi Schuurs scored the last two points in a quick succession and finally won the set by three points. Elise Mertens and Demi Schuurs will now face Timea Babos and Kristina Mladenovic in the final of Birmingham Classic 2018. Result: Timea Babos and Kristina Mladenovic defeated Katerina Siniakova and Barbora Krejcikova by 7-5, 7-6(6). Despite taking the lead in the first set, Katerina Siniakova and Barbora Krejcikova failed to extend it large enough for their opponents. However, Timea Babos and Kristina Mladenovic recovered the lead after some time but Katerina and Barbora were also fighting back. Soon the score was equalized 5-5. But in the end, Kristina Mladenovic and Timea Babos sealed their win after Katerina and Barbora lost a point on their serve. The match moved on to the next set in which Timea Babos and Kristina Mladenovic opened the scoring. However, both the pairs gave their best performance as the set eventually came to a tie-breaker. All of them were playing confidently in the tie-break but in the end Katerina Siniakova and Barbora Krejcikova lost the last point on their serve which led them to failure in this set. Timea Babos and Kristina Mladenovic will now play against Elise Mertens and Demi Schuurs in the final of Birmingham Classic 2018. Fans and @wta players love a selfie 🤳 at the #NatureValleyClassic! Join allsportspk to see the highlights of the final day of Birmingham Classic 2018. Previous articleBreaking World Cup 2018 – Germany Vs Sweden: Germany is the…?